REN Keep Young And Beautiful Instant Firming Beauty Shot Plumps, Remodels, Lifts and Firms ageing skin. 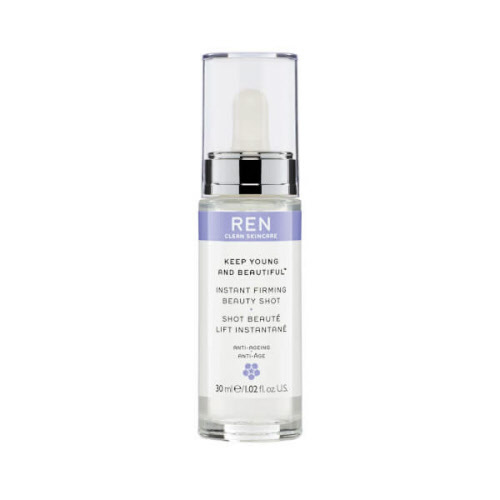 REN Keep Young And Beautiful Instant Firming Beauty Shot contains Yeast Bio-fermentation. This helps to improve cell cohesion of the keratinocytes for a lifing effect and stimulates the synthesis of elastin. Red Algae works on the skin's surface to mechanically tighten and lift showing instant results. To use: Apply one pipette to clean skin under your moisturiser. Reapply as necessary throughout the day over your day cream by gently tapping with the fingertips. Powered by ShopFactory to sell P1544 online. All-in one eCommerce and online shopping cart software.